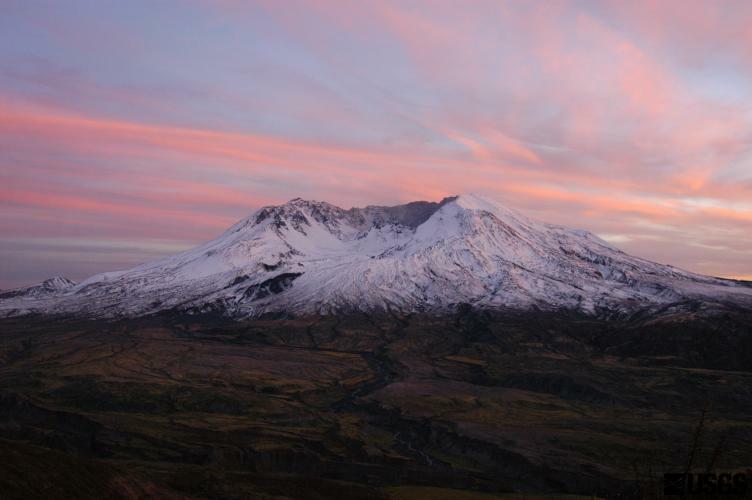 Sunset on the crater rim and flanks of Mount St. Helens, with Mount Adams in the distance. Mount St. Helens' crater, October 2004, aerial view from the east. 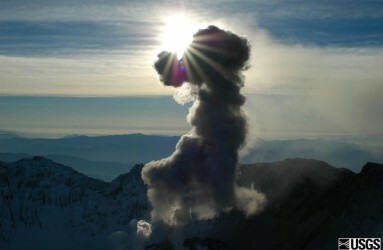 Plume from November 11, 2004 eruption of Mount St. Helens, looking into the sun. 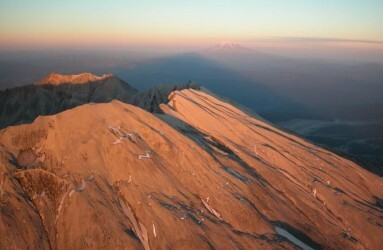 Sunset, as seen from Johnston Ridge Observatory (JRO). 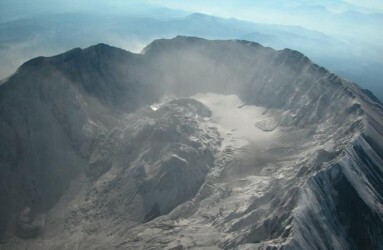 Dome within Mount St. Helens' crater, November 2004, aerial view from the north. 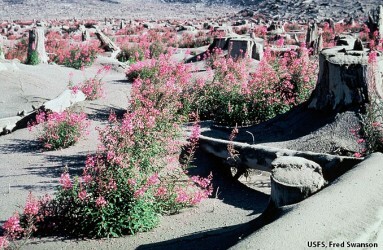 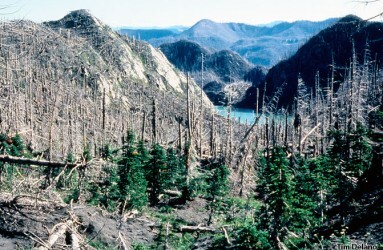 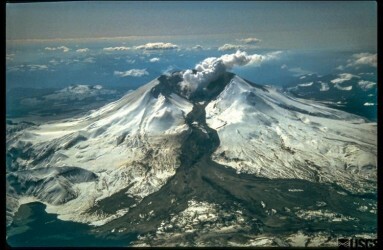 Mount St. Helens new growth, from the northwest. 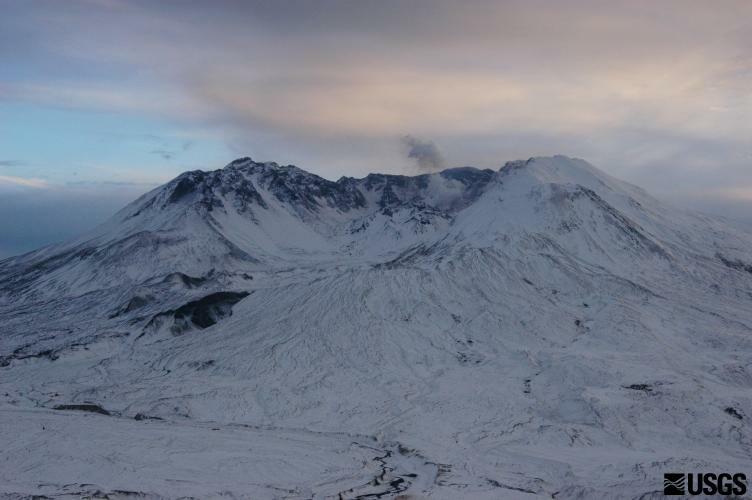 Evening view of Mount St. Helens from the Johnston Ridge Observatory (JRO). 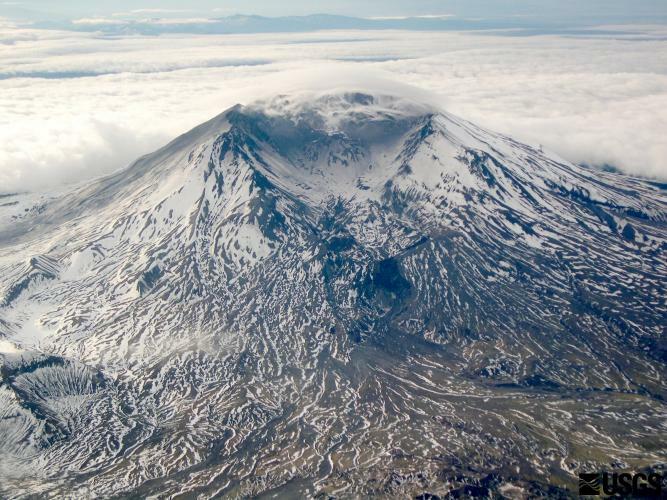 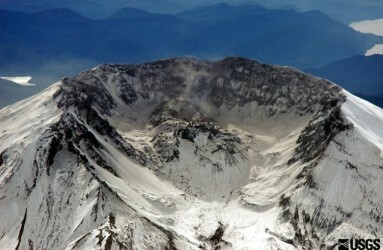 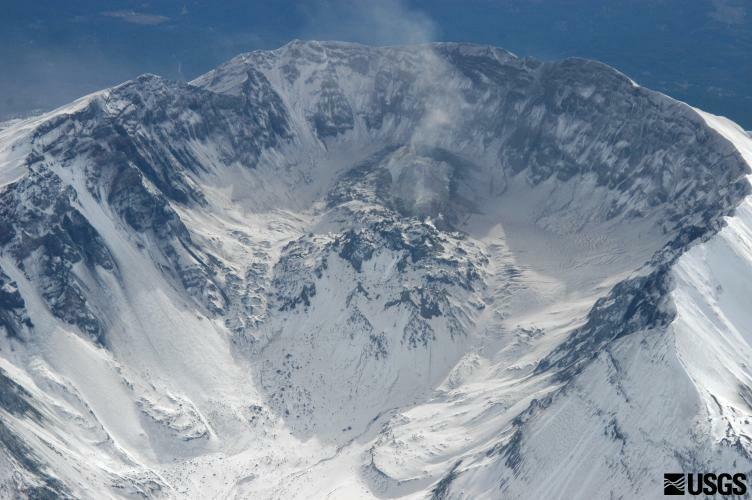 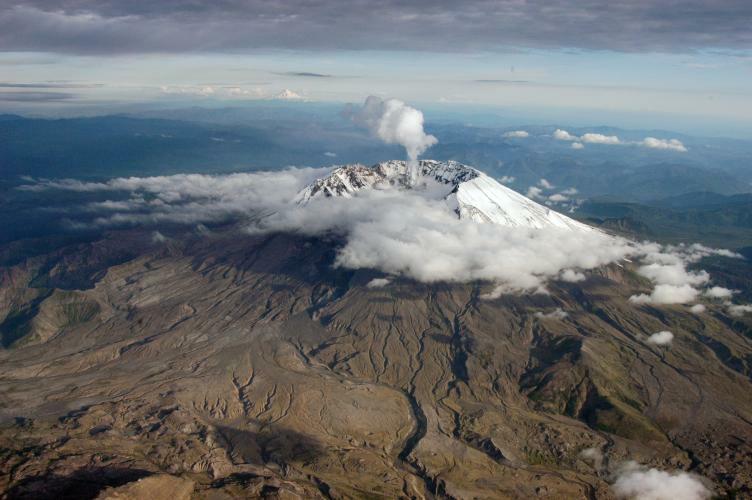 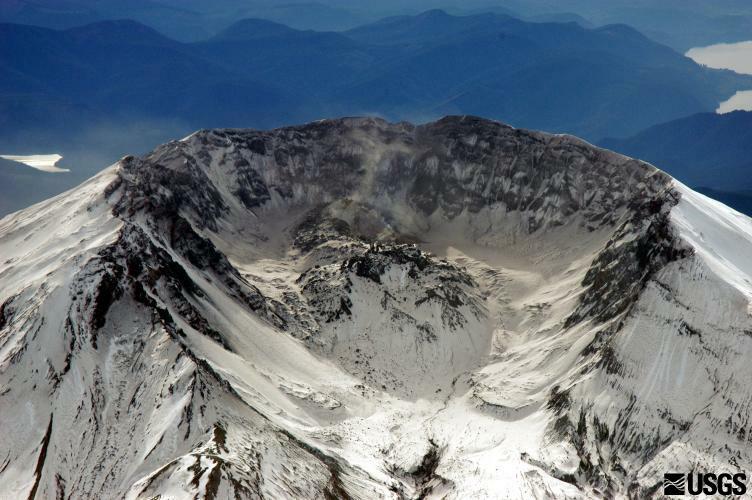 Aerial view, Mount St. Helens' crater and dome, as seen from the northeast. Note dusting of ash on Mount St. Helens' flank, left near rim. 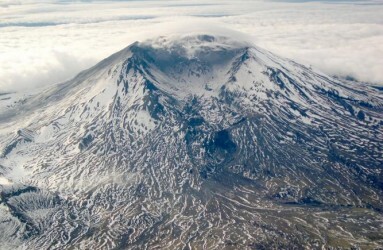 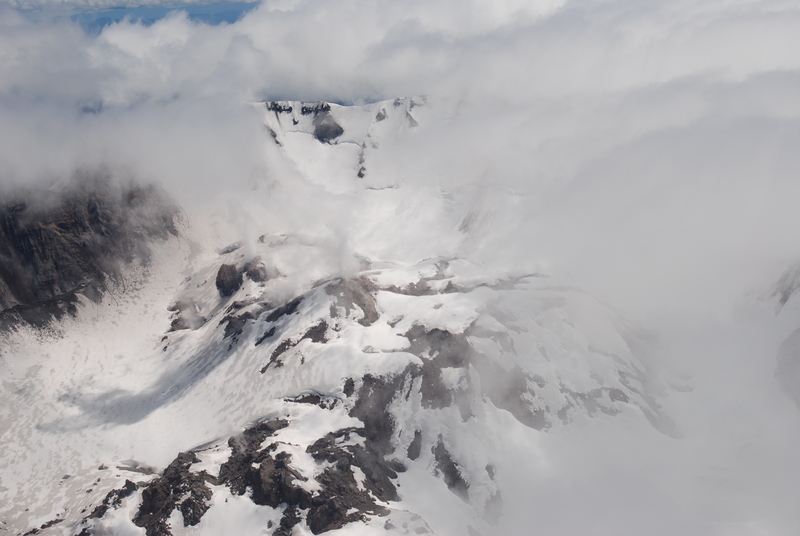 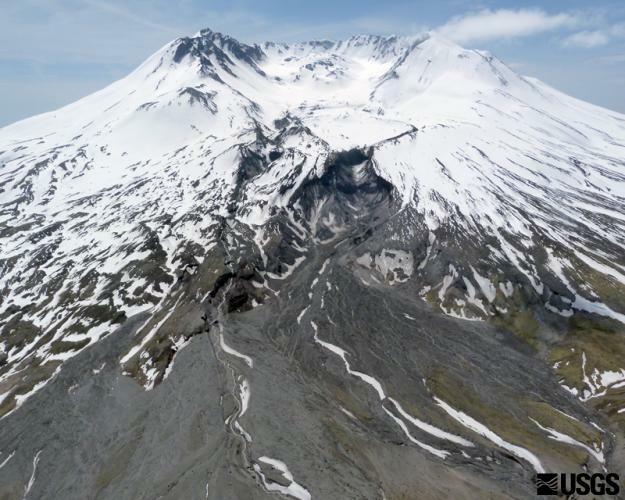 Aerial view, Mount St. Helens' crater and dome, as seen from the north. 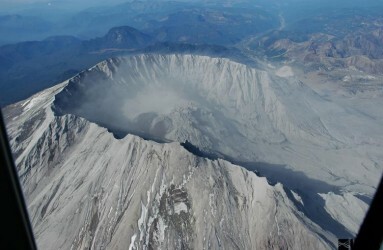 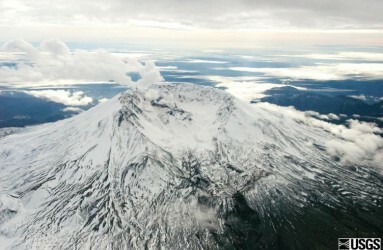 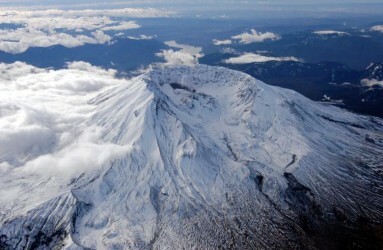 Aerial view, Mount St. Helens' crater and dome, as seen from the northwest. 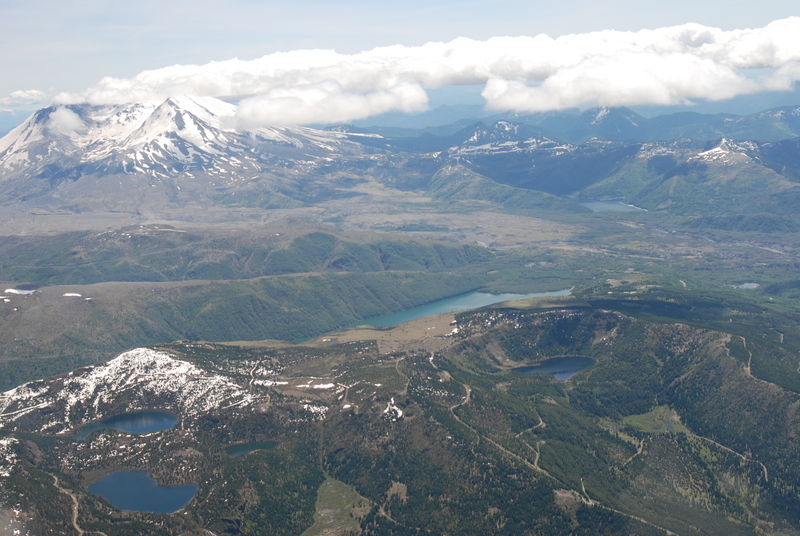 Mount St. Helens aerial view from the north-northeast. 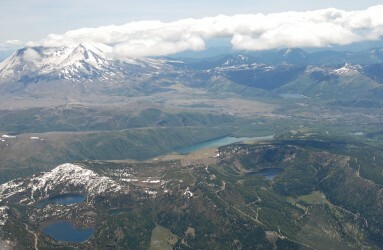 South-facing aerial view of Mount St. Helens with Mount Hood (left) and Mount Jefferson (right) on the horizon. 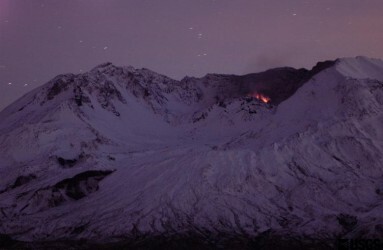 June 8, 2005. 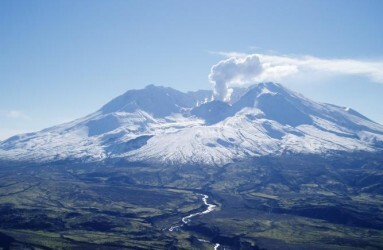 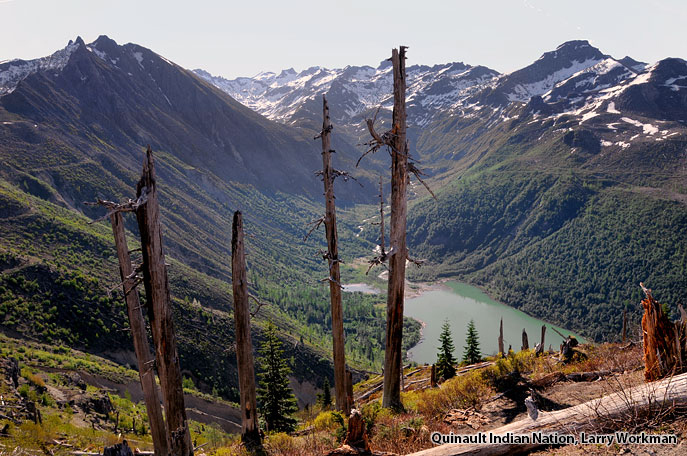 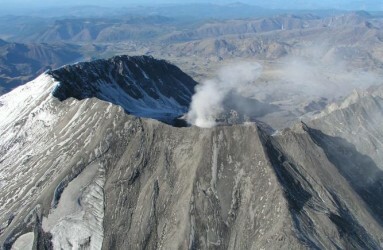 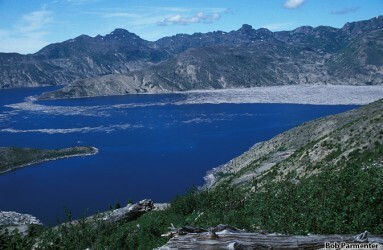 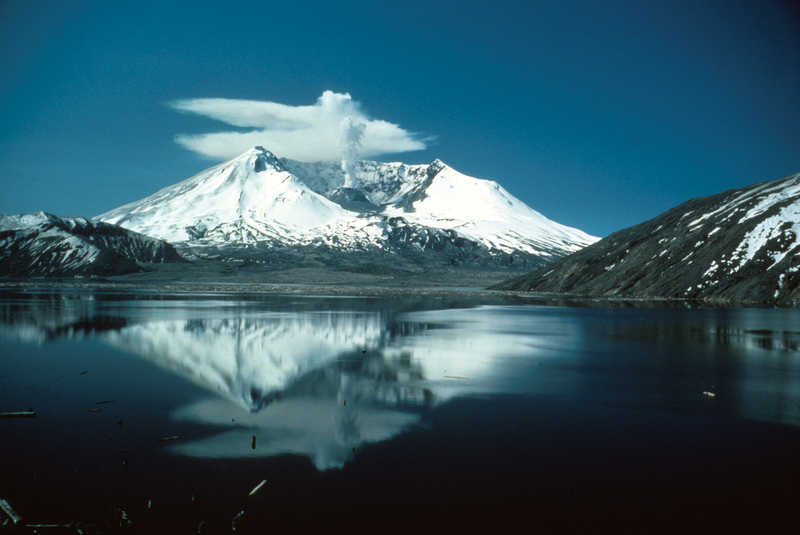 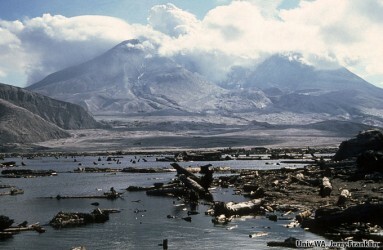 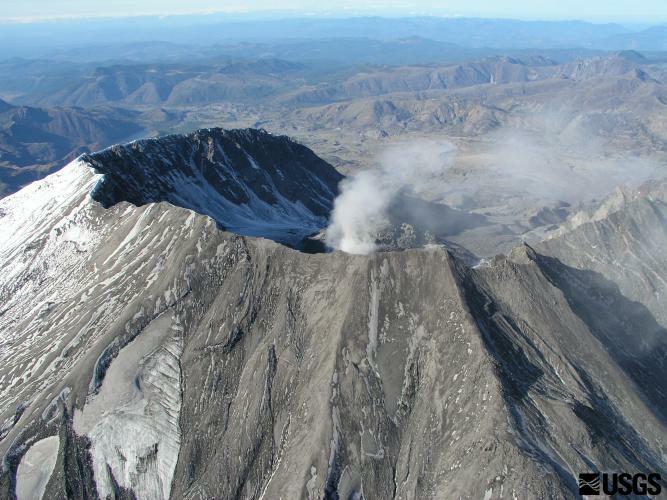 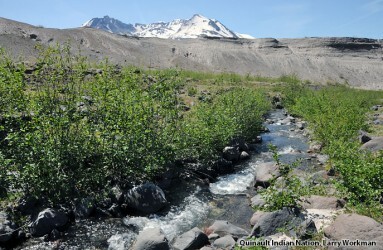 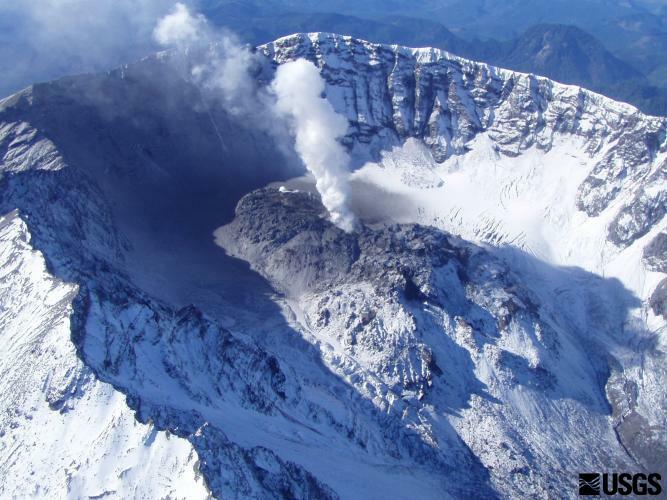 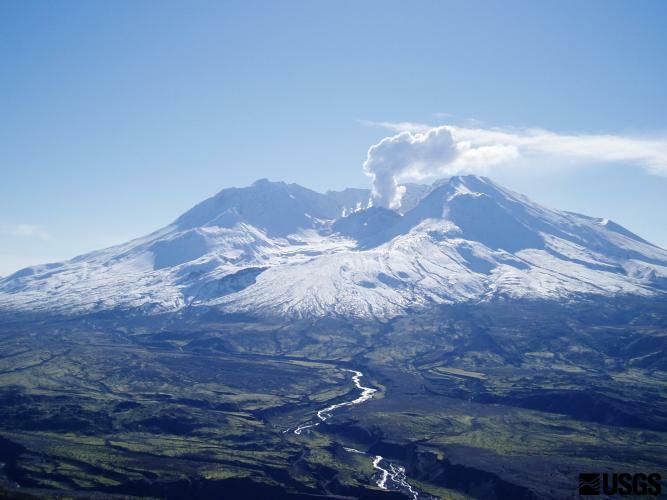 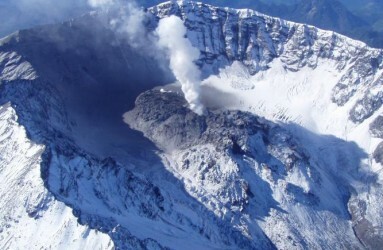 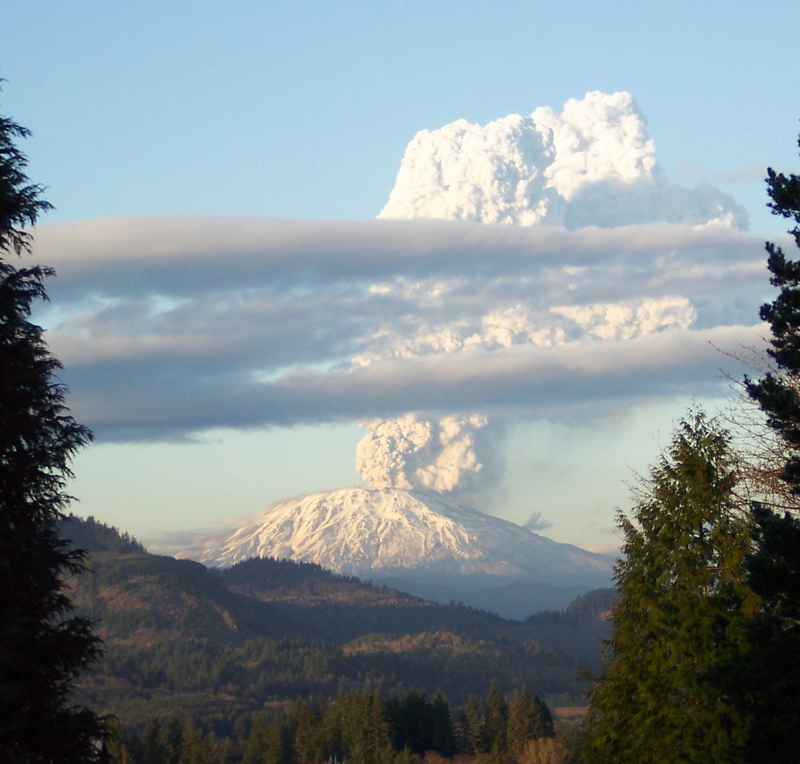 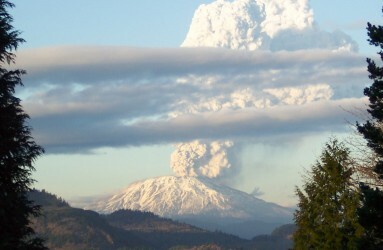 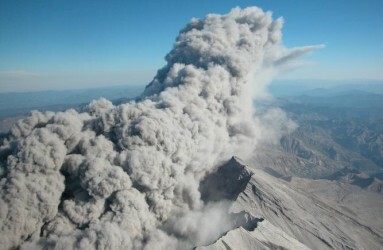 Plume rises from Mount St. Helens' dome, Spirit Lake in foreground; view from the north. 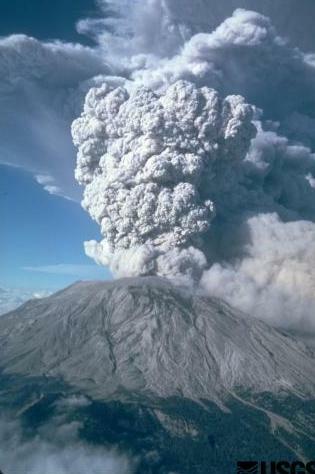 May 19, 1982. 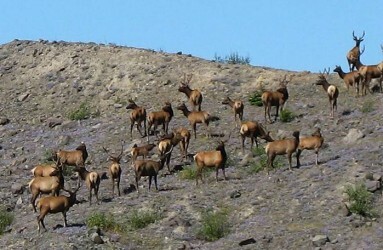 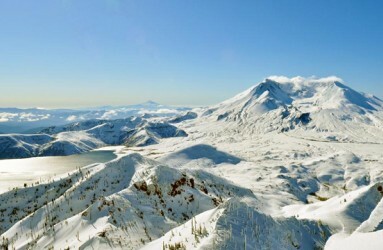 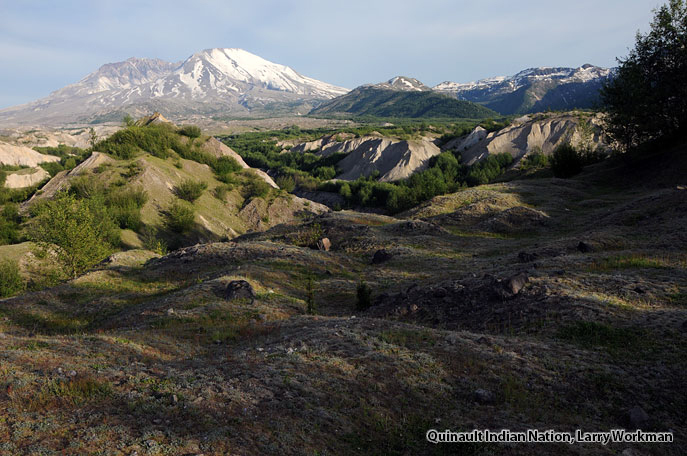 Panorama shows Mount St. Helens with Mount Hood and in distance. 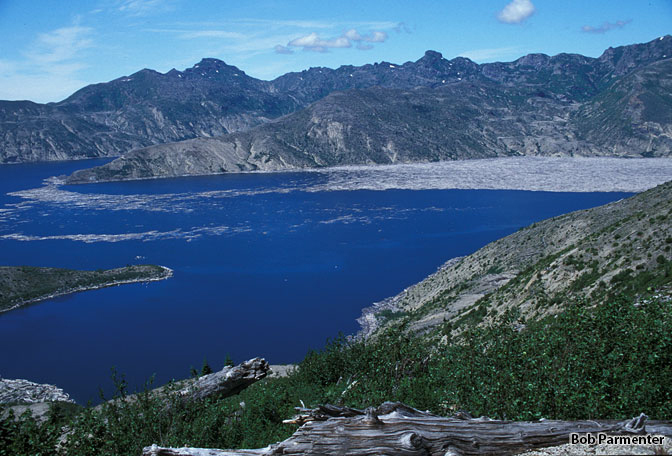 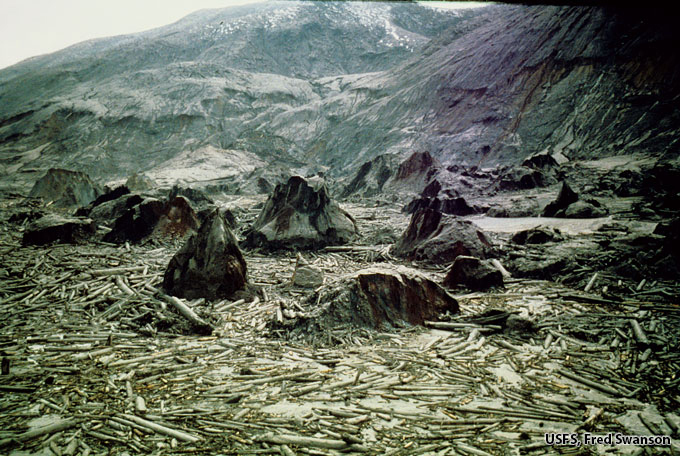 Depositional fan in foreground of Mount St.Helens crater formed as material eroded out of the crater. 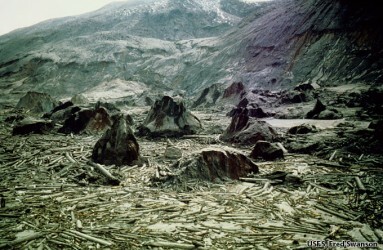 Volcanic sediment is transported continuously by stream water and occasionally by debris flows. 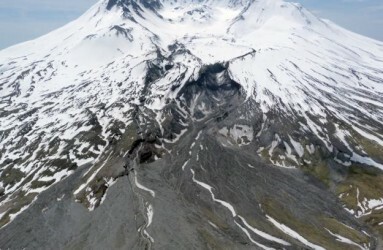 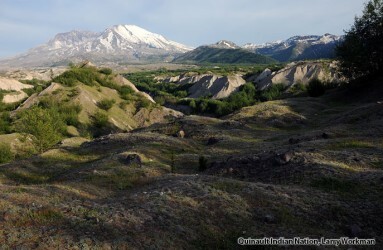 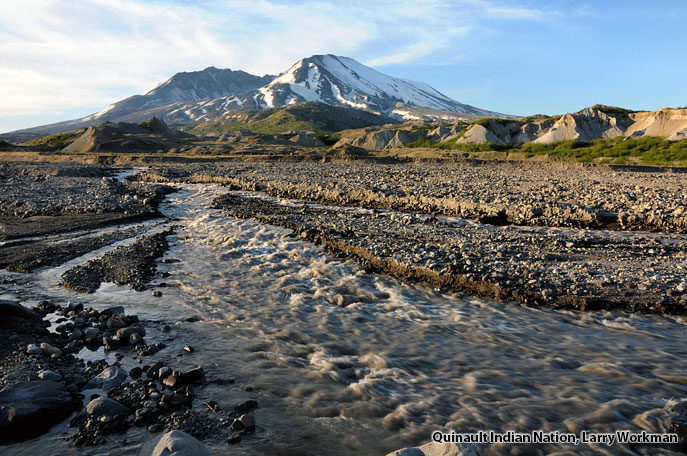 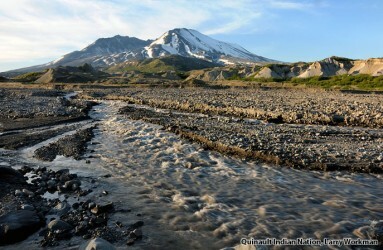 Lahar (dark deposit on the snow) originating in the Mount St. Helens crater after an explosive eruption on March 19, 1982. 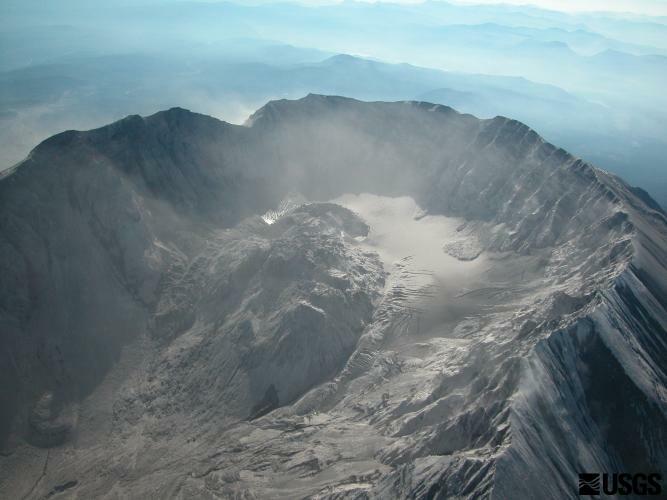 Dome and glacier within Mount St. Helens's crater, October 2004, aerial view from the northwest. 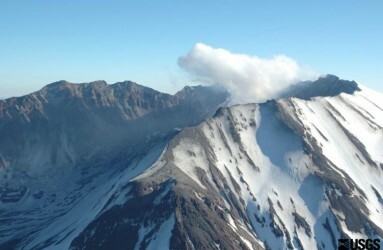 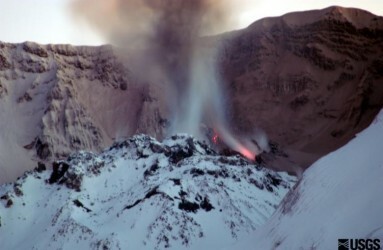 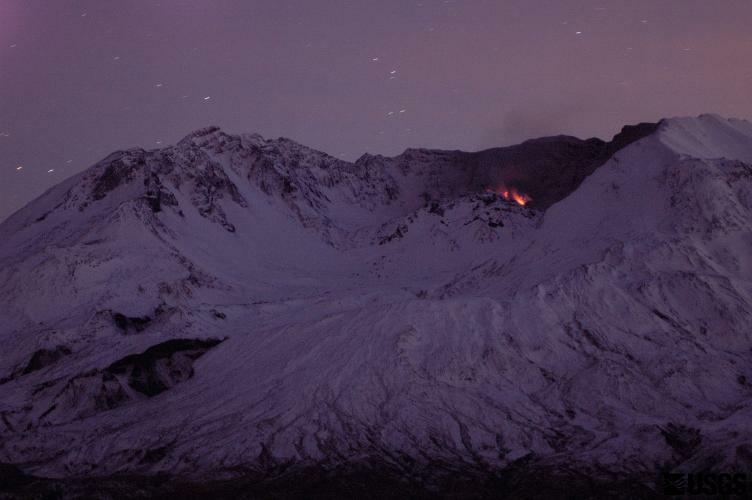 Dome within Mount St. Helens' crater is hot and glowing as it grows, viewed from Johnston Ridge Observatory (JRO), with base of small steam and ash plume. 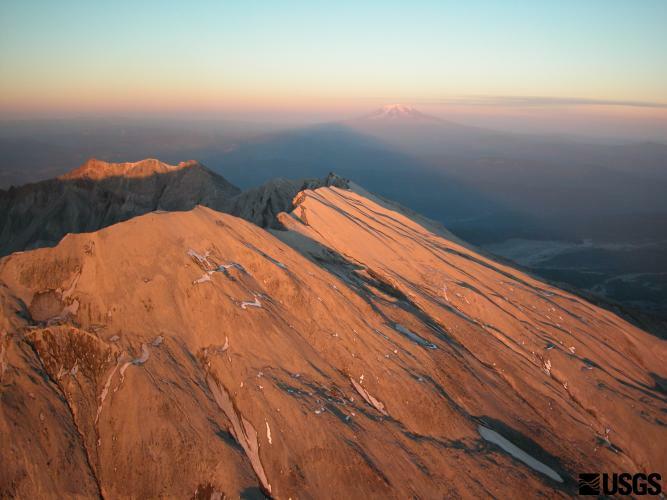 ight shot (approximately 7:30 PM PST) of new growth on Mount St. Helens' lava dome, as seen from Johnston Ridge Observatory (JRO). 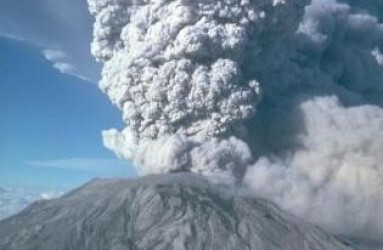 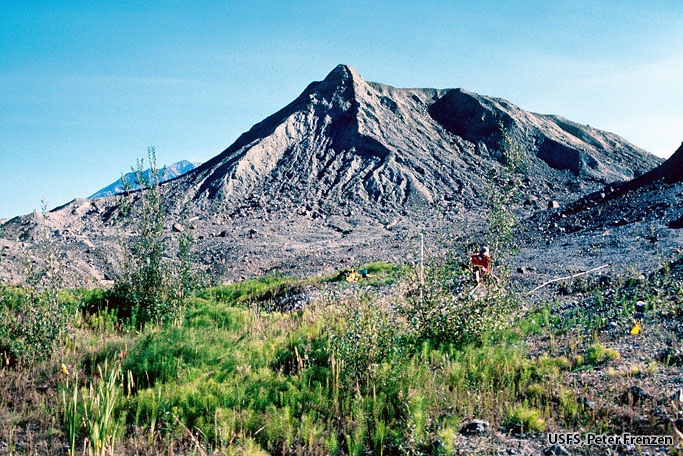 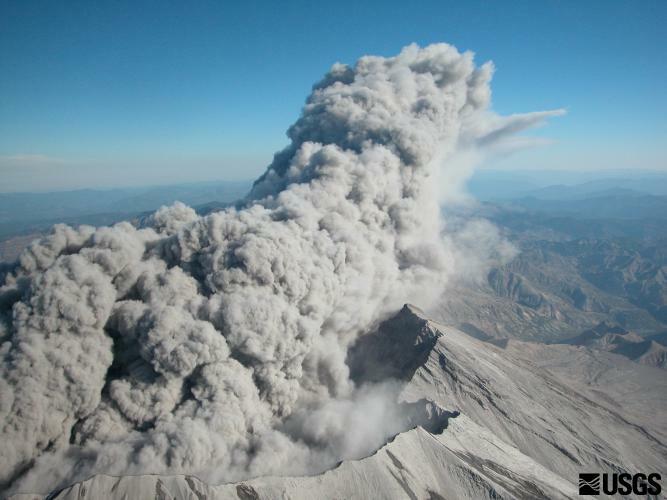 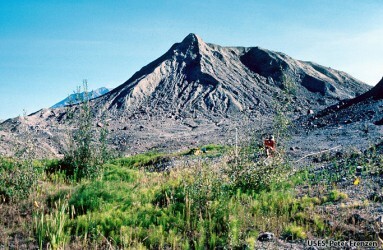 July 22, 1980 eruption of Mount St. Helens sent pumice and ash 6 to 11 mi (10-18 km) into the air, and was visible in Seattle, Washington (100 mi/160 km north).